Jennifer Guinness Kidnap. R31..10.04.1986..04.10.1986..10th April 1986..After a two day news blackout, Gardai relaesed the news that Jennifer Guinness,wife of merchant banker John Guinness, had been kidnapped.She was kidnappped from the family home in Bailey, Howth Co Dublin. During the kidnap John Guinness was pistol whipped by the assailants and it was he who raised the alarm. 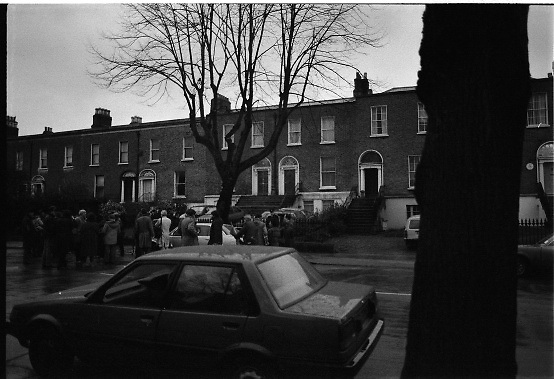 A ransom of £2million was demanded for her safe return...A view of the House on Waterloo Road,Dublin where Jennifer Guinness was held by the kidnappers.The kidnap saga ended with the safe release of Mrs Guinness and the arrest of the kidnappers. Mrs Guinness said that the kidnappers moved her to a new location every two days.